Note: A scored line in glass can be broken easily with the help of a Wafer Cleaving / Glass Breaking Pliers. These professional scribing tools are used in the electronics industry for scribing of delicate components or any other scribing tasks calling for precision work. All scribing tools have hardness-oriented, quality, industrial diamonds for outstanding performance. A 60° included angle is standard. Diamond configuration: all diamond bases are 0.25mm (.01") diameter with a final tip radius of 5µm. Depth of diamond (tip to base) is 0.15mm (0.006"). Thread is 8-32. Note: Tools are available in straight or bent tip configuration with a variety of shaft diameters and tip lengths but the actual diamonds are consistent in size. Wood box contains one each of all the tips offered (see below for details). Useful for reaching into and in between high density commponents. Useful for reaching into tight places. 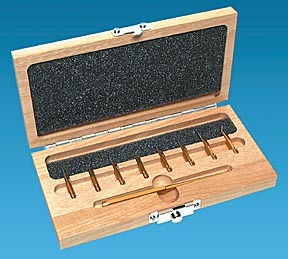 These general purpose scribing tools are suited to a wide range of industrial and laboratory use. Each of these high-quality hand-held tools is equipped with a polished quality industrial diamond that is vacuum bonded to a 1.57mm (0.062") dia. steel tip shaft. Scribes create fine lines in a wide range of materials, from metals to silicon to plastics to glass. A scored line in glass can be broken easily with the help of a Wafer Cleaving / Glass Breaking Pliers. The unique high-precision tips of these scribers allow greater accessibility to smaller work areas and make it possible to continuously view what is being scribed. They are ideal for applications that require very low tolerances. Applications include scribing under a microscope, precision scribing and repairing thin film circuits, micro circuits, small circuit boards or integrated circuits. This fine point scribe (0.005" radius) may also be used to clean or trim circuits or break or build up new lines. Overall length is 120mm (4.72") and the diamond has a 60° included angle. Tip shaft diameters are 0.8mm (1/16") x 8mm (5/16") long. This high precision pin vise handle is machined from the finest materials. It is light weight and versatile, with a precision tool steel drawbar for positive collet chuck clamping. The 8mm (0.31") wide aluminum hexagonal barrel 100mm (4") long, overall length is 115mm (4.53") fully assembled, has a knurled finger grip for positive precision control in handling and tool manipulation. Supplied with a standard collet chuck bore diameter 2mm (0.078") and small collet adapter bore diameter 0.8mm (0.030") for diamond stylus chucking (diamond stylus is shown in photo above but must be ordered separately, see 13663 and 13664 below). Precision Ground Diamond Scribe (fits handle above) 60° included angle, 0.25mm and 0.5mm tip diameters each with a 0.8mm dia. mounting shaft. Tip radius 0.0005" (0.013mm) on both diameters. High-quality precision diamond scribing tool in a durable chromium pen housing. Screw-type precision mechanism works smoothly and diamond mounting (quality industrial diamond tip) is firmly affixed when exposed; no wobble. Twist-type barrel exposes or retracts diamond tip. Refills available. Diamond is ground and lapped to a 60° included angle. Overall length is 133mm, weight is 26 grams. Plastic pen-like handle with steel shaft; diamond tip. Marks glass slides, scribes metal, scores for breaking wafers, glass, and glass knives. Tip included angle: 90°; Shaft diameter: 3.15mm (0.124"); Shaft length from handle, with diamond: 5.9mm (0.232"); Diamond diameter, exposed: 1.14mm (0.045"); Diamond length, exposed: 0.86mm (0.034"); Overall length, without cap: 155.6mm (6.125"). Note: After scoring, glass or wafers can be broken easily with the help of a Wafer Cleaving / Glass Breaking Pliers. The Tungsten Carbide Pen Scriber offers a sharp, tungsten carbide tip in an attractive pen style. The tip can be used to permanently scribe glass, ceramic and plastic. The tungsten carbide tip retracts into the pen for safety and storage. The pen scriber measures 9.8mm in diameter and 137mm in length (0.386" x 5.4"). Clips to pocket like a ballpoint pen. Retractable tungsten carbide tip to scribe on glass, ceramics and plastics. Tip included angle: 40°; Shaft diameter: 1.55mm (0.061"); Tip length (angled area): 2.13mm (0.084"); Shaft length from pen body: 4.24mm (0.167"); overall length 133mm (5-1/4"). The Retractable Diamond cleaver is retained in a quality metal casing with pocket clasp. Ground and polished natural diamond has a 90° included angle with a relief angle of 30°. The carbide cleaver is made from a solid carbide rod. It has two angled sides that intersect into a very sharp cutting edge of about 4mm in length. A third angle is lapped on the very tip to prevent breakage. Carbide is mounted into a non-rolling hexagon shaped anodized aluminum holder. The new Sapphire Burnishing Tool is indispensable for delicate burnishing of fine instrument parts such as miniature pivot points, shafting and probes. Materials can be hard steel, carbide, glass and ceramics. It may also be used for deburring of soft and hard materials. The precision ground sapphire (ground on all 5 exposed surfaces) is mounted in a non-rolling (the tool won't roll off the bench) hexagonal gold anodized aluminum holder. It is sold in a plastic storage and shipping container, one tool per container.